Any ideas, i've tried a few things? HELP! Any ideas, i've tried a few things? So this started a few weeks ago, I suspected it was calmag, so Ive gave her a few feeds with calmag but I don't think she's getting any better. I've now flushed her and checked the runoff ph and it's at 6.5. Any ideas what it could be? Last edited by Haunts; 03-11-2019, 08:38 AM. Ok, so I've grown one plant through and what I see looks like a root problem. The fact that you have a good nutrient schedule does not make me think that it's a K deficiency. So as long as you already have the pot drained Id check the roots. It could be a way to check for bugs, fungus, mold, or anything else. Check the roots man, and good luck. Just my opinion so don't freak out on me, k? Let me know what you think, and if you figure it out! Thanks, for looking in. Ive never checked on roots before, is it safe to with it being an auto, I know they say to plant autos directly into there final pot because they only have a certain life cycle it's best to to stunt them. I wouldn't disturb the roots, this late in that plants life it will make it even if it's having a problems. checking the roots will only slow it down being an Autoflower I'd say no. I'm not familiar with bio bizz, so I'm not the best to help you here but it looks like Nute burn or lockout. I'd suggest give it a flush and restart your nutrients. Thanks for you help with this, I grow in a very small cabinet 45cm(18in)x45cm(18in)x80cm(31in) so I'm very limited with space and the size of plant I can grow. The light is as high as I can go but I can dim it, I've just never done it, at the canopy peak the lux meter is reading 80000 which I believe is borderline to bright. After the flush do I just go back to the regular feeding schedule or should perhaps do half the recommended amount? If you can't move your light up don't worry about it for now, but keep it in mind. After the flush and pots have dried do a full feed then next time the pots are dry give water only and see how the plants are doing after that. If they are getting better then continue alternating, your not but 3 to 4 weeks from Final Flush/harvest. Thanks again for your help. I'll see how she gets on. Sure do wish I had an answer for you. I have had the exact same issue with my last three (and only) auto grows and haven't had any luck figuring out the cause. I never had the issue with any of my photo grows so I am going back to growing photos. I have seen others with this problem too so it sure would be nice if someone is able to figure out what is causing the issue. Good luck! 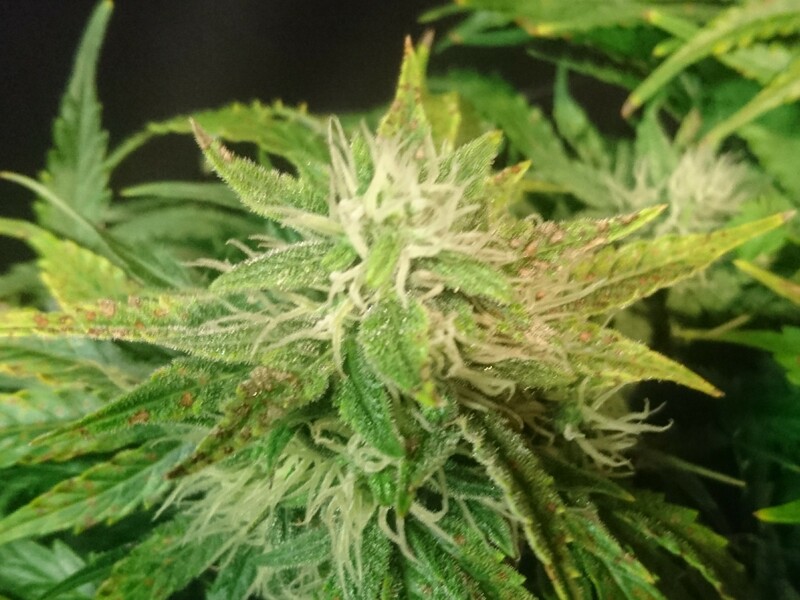 I limped home with my last grow but had to harvest a little early as there were hardly any leaves left uneffected. It smokes okay but yield was low. Yeah this isn't the first time I've had this issue PuravidaC. Last edited by Haunts; 03-14-2019, 08:04 AM. Haunts, were your other issues with autos or photo's too? Autos, that's all I grow, even using different nutrients lines it still happens.